A group of ten European journalists (from France, Germany, the Netherlands and the United Kingdom) will visit the Biodiversity Centre on June 11, to learn about “clean technologies”. The delegation will also have the opportunity to meet representatives from GenoRem, a major phytoremediation project involving IRBV researchers. With financial support from Genome Canada and Génome Québec, the project’s objective is to study decontamination of polluted soils using plants, fungi and bacteria. After a tour of the Centre’s laboratories, the journalists will head to Varennes, to see experimental plots located on the site of a former refinery. The Université de Montréal’s Office of the Vice-Rector of Academic Activities presented its 2012 Teaching Excellence awards on May 25th. These awards honor professors for their exceptional contribution to students’ academic progress. In the tenured professor category, an award was presented to Jacques Brisson, full professor at the IRBV. He received the award for his exceptional communication skills and teaching abilities, which are greatly appreciated by his students. Involved in both fundamental and applied research, his work focuses on population ecology, competition between plants, control of invasive species and water filtration by aquatic plants. Joining former IRBV laureates Mario Cappadocia (FAS 2006 Teaching Excellence Award) and David Morse (FAS 1999 Teaching Excellence Award and 2008 Provost Prize for Innovative Teaching), Jacques Brisson continues the tradition of teaching excellence at the IRBV and contributes to the training and development of passionate future scientists in plant biology. Studies in phytoremediation being conducted by Michel Labrecque’s research team were discussed recently on Radio-Canada’s television program “La semaine verte”. In interviews, Michel Labrecque and Frédéric Pitre explained how plants, particularly willows, can extract organic contaminants and metals from polluted sites. This is a more ecological and economical approach to restoring abandoned industrial land. The website AphID, a guide for identifying cosmopolitan and polyphagous species of aphids, was developed by researchers from several American and Canadian institutions, including the USDA CPHST Identification Technology Program (ITP), the University of Maryland, the Systematic Entomology Laboratory (SEL) and the Université de Montréal. AphID was designed to assist port and quarantine officials in simple, preliminary identification of aphids. 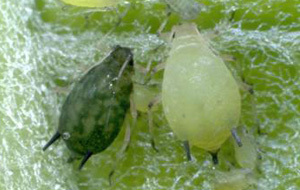 Aphids are sap-sucking insects most common in temperate zones around the globe. They cause direct damage to plants by feeding and serve as vectors for viruses, while their honeydew promotes mold and attracts ants. Many aphid species with significant economic impact have a worldwide distribution, but officials are particularly interested in detecting those not yet found in North America. The annual meeting of “The International Compositae Alliance” will be held at the IRBV and the Biodiversity Centre from July 15-18, 2012. The theme of this year’s event is “The Evolution of Compositae”. The Université de Montréal’s Department of Biological Sciences will hold its XXIInd Symposium from April 3-5, 2012. This year’s theme is “A World in rEvolution”. The objective of this activity is to familiarize biology students from the host university and other Montreal academic institutions with research in progress in the Department’s laboratories. The Symposium also offers a venue for the Department’s researchers to spotlight their laboratory projects. Undergraduate and graduate students who have completed a project in the context of an introductory research course and/or in a work-study program, as well as faculty, are invited to present recent findings. The theme of the sixth annual conference of the Société québécoise de phytotechnologie (SQP, Quebec Phytotechnology Society), to be held on May 31, 2012, is “Green roofs and walls: findings and perspectives”. This will be a unique opportunity to hear presentations by international experts including Nigel Dunnet and Daniel Roehr, and to experience a virtual visit of green roofs from Chicago to Sweden! Since a limited number of participants can be accommodated at this popular event, early registration is important. The Biodiversity Centre is featured as a case study on the VoirVert.ca website, a portal focusing on issues in sustainable development. 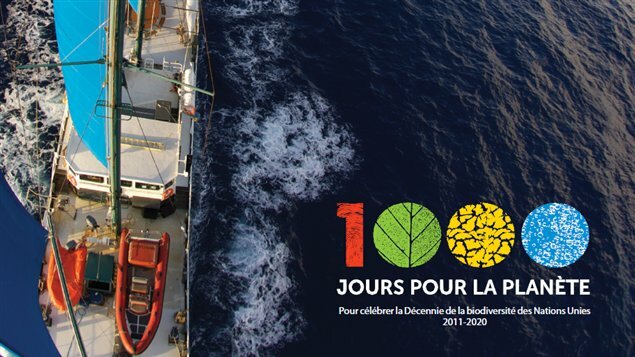 The Biodiversity Centre is mentioned in news media coverage of “1000 days for the planet”, a daily log of an ocean expedition on board the sailboat Sedna IV. Scientist Jean Lemire and his team will travel around the world for three years. More information in: La Presse, Radio-Canada and CNW Telbec.